If you’re going to follow me for debt-free college and career information, you need to be convinced that I have the background and credential to give you the information that’ll change your kids’ lives. Episode 1 of this podcast will convince you of that. Plus, it’ll do one other thing for you. Episode 1 will also bring you up to speed on exactly what two things you need to do right now to make sure you’re getting fast, free access to all the debt-free college and career information you need—right when you need it. Subscribe to Launch Your Teens on Stitcher, iTunes, or YouTube. You can also listen to Launch Your Teens at Podbean. Don’t forget to check out each episode’s show notes. Want more info about episode 1? Read on. This is the most important episode of the Launch Your Teens podcast, so listen to this one as soon as you can. You’ll get debt-free college help you can start using right now. 1. That this podcast isn’t about getting scholarships. Scholarships are a relatively small part of the process when it comes to getting kids through college debt-free. This podcast is about thousands of other ideas for getting kids through college or technical school debt-free, and into jobs they love afterward. 2. The personal story behind why I started this podcast. Learn how my heartbreak over my med school and grad school application clients’ debt set me on a path to getting this information out to the world. 3. The easiest ways for you to access all the best debt-free college help. Learn how to access them inexpensively—and quickly. Starting right now. 4. You’ll gain an exhilarating sense of hope and confidence. You’ll end this podcast episode with the feeling that everything’s going to turn out fantastically well for the kids you love—because you have all the tools you need to make good things happen. If you’ve got #kids ages 12–26, listen to the Launch Your Teens podcast. 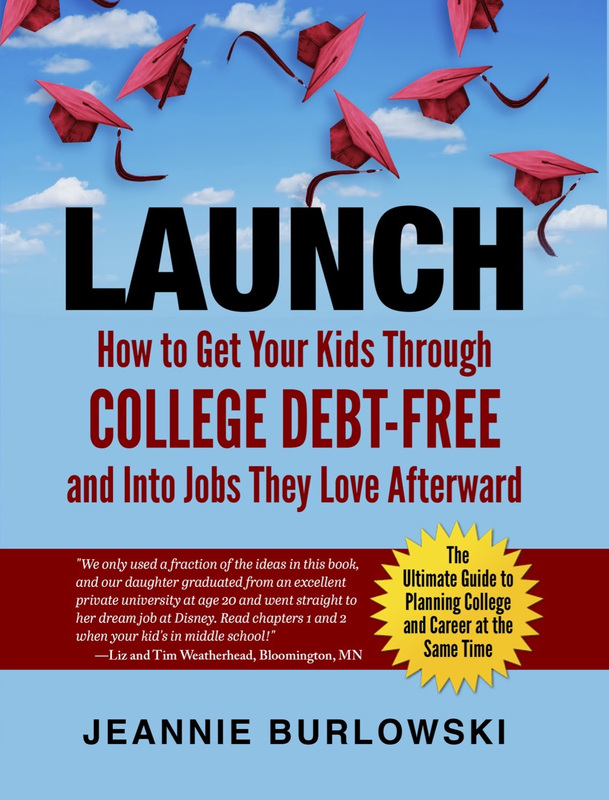 Lots of hope for getting your kids through #college #debtfree and into #jobs they love afterward. Listen on Stitcher, iTunes, or YouTube. When you’re a parent, it feels great to know that you’ve got the tools necessary to set your kids up for successful college and career life. Please click the LIKE or SHARE button on that Facebook post right now. You’ll be helping me get debt-free college help out to lower-income families who might never otherwise find out about it. What comments or questions do you have about this episode of the podcast? Comment below or LIKE Jeannie Burlowski Author on Facebook, find this post on that page, and let’s talk about it there.